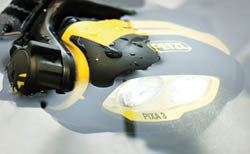 Petzl have recently brought to us their new Petzl PIXA headlamps range which we were of course very excited about! 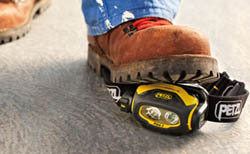 There are three headlamps in the range simply called the PIXA 1, PIXA 2 and PIXA 3. The really impressive thing about the entire Petzl PIXA headlamps range is how resistant they are to the forces of nature. Able of withstanding a two metre fall onto a hard surface and up to 80kg of weight (demonstrated in the image below). It seems like Petzl have really out done themselves once again, but let’s take a look at things which apply to all of the range first of all. Not only all of the above which makes the entire range seem like a gift from above for some hobbyists, but due to their certifications the Pixa range looks very interesting on a business side of things too. One final thing to mention about this entire range is that it is chemical resistant AND water resistant to IP67 (that’s 1 metre depth for 30 minutes to you and me), simply marvellous! To find out more specific information about each headlamp in the range simply click on their name below to expand the specific headlamp. Chunky, easy to use rotary switch. Breathe and take in the superiority of these headlamps over any competition. If you are a business and would wish to make an enquiry about these headlamps please contact us. 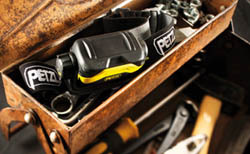 Please feel free check out our entire Petzl Range on our Online Shop.